Typing Test Pro is an easy-to-use, quick and customizable web-based typing test maker for all your business recruitment and training purposes. To commence the online typing test, enter the Account ID given by the company that has requested you to take a test. Typing Test Pro allows you to create customized and professional typing tests for recruitment purposes in just three easy steps. 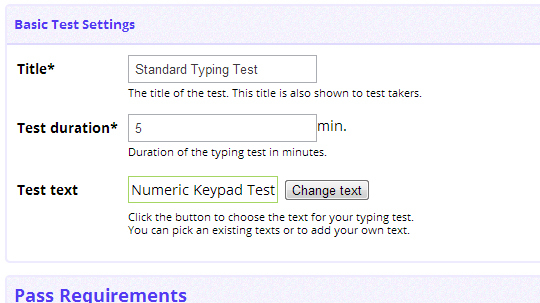 Simply subscribe to Typing Test Pro and start creating your online typing tests today. Besides using Typing Test for recruitment and pre-employment purposes, this tool can be put to many other uses. You can use Typing Test Pro for educational purposes, practice, e-learning, employee evaluation and any other areas where you need to assess typing speed. 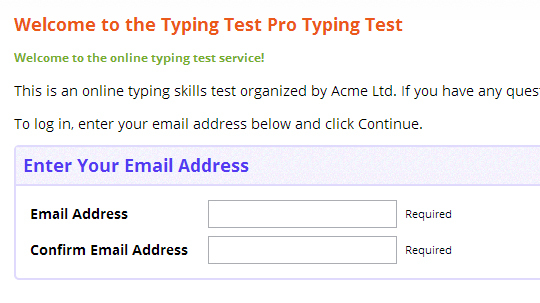 Working with Typing Test Pro is super easy and you can modify the tests to exactly match your business needs. 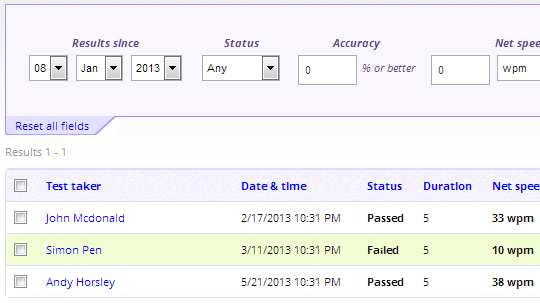 With Typing Test Pro your online typing test results are available online automatically and instantly. You don't have to wait to calculate results or generate reports. You can access individual performance, compare progress and make decisions instantly. You can choose to make test results available to test takers in real time, or keep them hidden. Typing Test Pro helps companies like yours to assess the typing skills of their candidates before calling them. Typing Test Pro is completely online making typing assessment easy, convenient and time effective. Subscribe, create tests, send invites to test takers, see results and generate reports with Typing Test Pro. Test takers can take the typing assessment test online, making the use of typing tests for recruitment purposes breeze! Besides setting up your tests easily, you can also modify the test durations, pass requirements and allow or disallow options like backspace, speed display and lots more. Plus, pre-set test with set options remains active on your account when you first subscribe - so you can start sending invites to test takers right away! So you can start sending invites to test takers right away! Typing Test Pro (formerly AssessTyping) has been on the market since 2002 and has sold more than 3500 licenses. We provide free support to all our customers and are focused on ensuring reliable solutions and continuous support to all. Instantly save hours of effort and paperwork with Typing Test Pro.